Every year, scientists from around the world gather in Japan to volunteer a week of their time to the construction of computer programs for enabling research on genomics. They might update a genome searcher; do mapping of ontologies for samples, environments, and experimental protocols; or develop an anime-inspired web site that answers questions about biomedical science (go to http://www.w3.org/2001/sw/ and type What genes are associated with Alzeihmer’s Disease? Caution: may be Not Safe For Work). In the evenings, those who choose to indulge can consume prodigious amounts of sake, which somehow always seems to degenerate into someone writing a computer program to generate haiku. Example: Myloid beta//protein classified with blood//coagulation). (That one might not have been from the computer program–as I said, there’s a lot of sake getting consumed at night at these things, and the paperwork trail for the poetry can get a little hazy.) At the end of the week, everyone goes away happy, and hopefully some new weapons have been built for the fight against disease and suffering. The event is known as the BioHackathon. A hackathon is an event in which computer programmers gather together to work intensively and try to solve some well-defined problem in a short period of time. BioHackathon is funded by the National Bioscience Database Center and the Database Center for Life Science, and organized by Toshiaki Katayama and Atsuko Yamaguchi under the direction of Prof. Toshihisa Takagi. It focuses on a technological approach called the Semantic Web. The Semantic Web, as defined by the World Wide Web consortium, is a framework for sharing data across computer programs. Modern-day biology and health science is all about data—massive amounts of data, inconceivable not that long ago—and people who work on Semantic Web technologies in the biological and health science domain are very involved in developing ways to enable researchers to search, reuse, and integrate that data in ways that can help us ask new questions about the relationships between our genome and our health. Where does the fish come in to the story? This is Japan, an island nation–fish is everywhere! I love all Japanese food, but the breakfasts are the best of all. I had mackerel and kari raisu for breakfast every day. The evening before I left, we went out for what might be the absolute best sushi I’ve ever had in my life. Fish are very important in genomics research, actually–particularly the zebrafish (Danio rerio). They have been used to investigate an unusually wide variety of things. 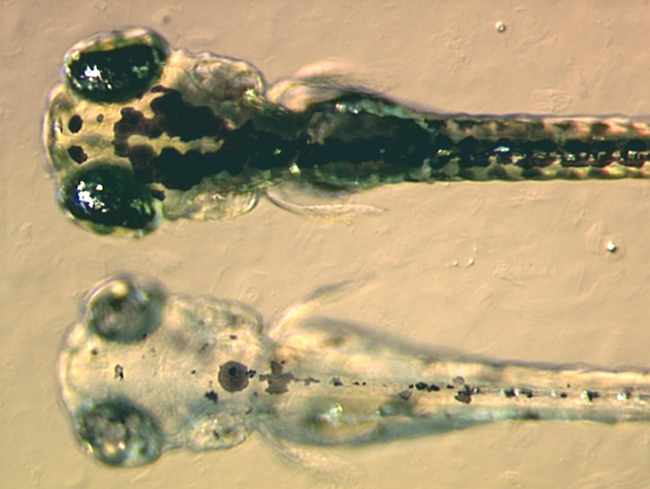 For example, zebrafish can be bred to have transparent skin, which allows researchers to observe the development of its internal organs and, because their genome is fully sequenced, how modifications in its genes can affect that development. This strain should help us learn things that can be applied to research on human cancers, especially leukemia.